At the age of 13, Meazza admired AC Milan, but was rejected by them for being too skinny. However, he was received with open arms by Internazionale. He was randomly observed juggling a rag ball in the street by an Inter scout and quickly signed. They fed him steaks so he would get bigger and stronger. At first he was used to fill a gap in defense instead of being allowed to follow his attacking instinct, but luckily Inter’s junior coach later corrected the mistake. He scored two goals on his debut in a 6–2 win against Milanese Unione Sportiva in the Coppa Volta di Como. 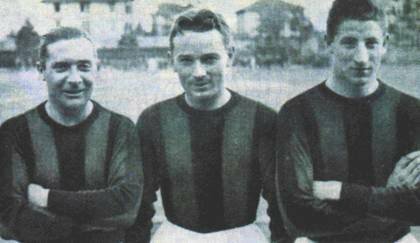 Meazza still holds the record for the most goals scored in a debut season in Serie A, with 31 goals in his first season (1929–30). The year before, when Serie A did not exist, and the Italian Championship was composed of 2 leagues (North and Central-South) with playoffs, Meazza played 29 matches, scoring 38 goals at the age of 18 years. He scored 5 goals in a single game, twice in one season: 6 January 1929 Inter against Pistoiese 9–1 and 17 March 1929 Inter v Verona 9–0. 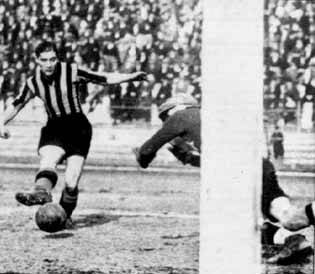 That same season (1928/29) on 12 May 1929, he scored six goals as Inter beat Venezia 10–2. 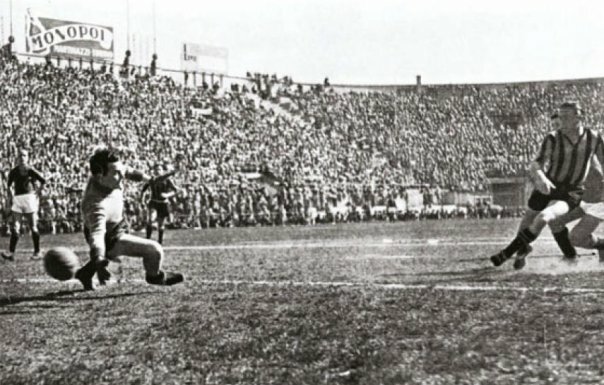 27 April 1930 was the first time Inter ever played AS Roma in Milan. 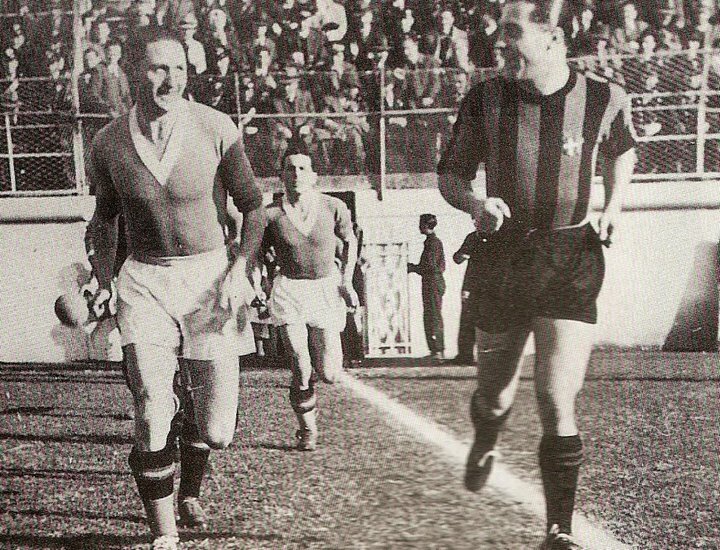 Inter won 6–0 and Meazza scored four goals, scoring his first three within three minutes of the game. 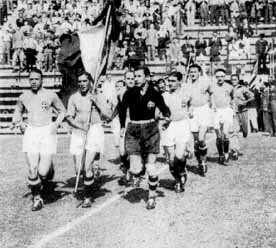 With Meazza on the squad, Inter (re-christened Ambrosiana while under Fascist law) won 3 national championships in 1930, 1938 and 1940, and helped win the team’s first Coppa Italia in 1939. The 1930 championship was Inter’s first since 1920 and they were considered underdogs to teams like Bologna, Torino, Juventus and Genoa. It was Meazza’s dazzling form that clinched the inaugural Serie A title. In the deciding game, he scored a second half hat-trick to tie the game against Genoa after Inter had been down 3–0. 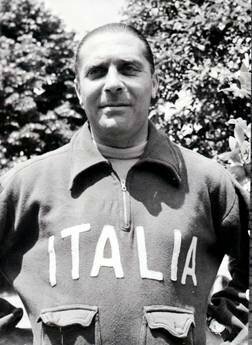 He was top-scorer of Serie A 3 times (1930, 1936, 1938), top-scorer in the pre-Serie A year of 1929 and top scorer of the Mitropa Cup three times: 1930 (7), 1933 (5) and 1936 (10). 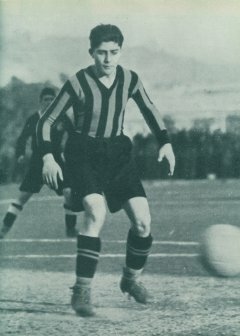 During the 1933 season, Meazza made a bet with Giampiero Combi, goalkeeper of Juventus and captain of the 1934 World Champion Italian National Team. 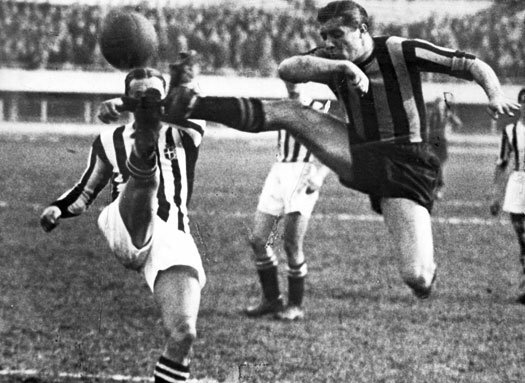 Combi challenged Meazza, claiming that nobody, not even Meazza, could sidestep him to score a goal. Meazza accepted the challenge. Combi also made another bet with Meazza. A few weeks earlier, while training with the national team, Meazza scored a splendid bicycle kick against the Juventus goalkeeper. Combi wagered that he could not repeat it in an official game. The next game between Ambrosiana Inter and Juventus was played in the Arena Civica of Milan on 25 May 1933. Meazza managed to score two stupendous goals. The first goal was an identical overhead kick to the one he had scored against Combi in practice. For the second goal he dribbled through a series of defenders, before faking out Combi, dribbling past him, and scoring a tap-in goal. Combi immediately got up and shook Meazza’s hand. Sometimes his love of champagne and woman would cause him trouble with the board of directors. “Luckily I lived near the stadium, and I managed to get there in a rush. My teammates and the coach looked at me disapprovingly. It was only five minutes before the kick-off, so I quickly changed and joined the team on the pitch. I could hear the Inter directors saying: ‘We’ll deal with him after the match. We’ll find out what he’s been up to.’ Luckily I scored a hat-trick so afterwards no one said a word!” Giuseppe Meazza. Incidents of the sort soon became common. In 1937, it was the day of the game against Juventus in Milan with only an hour before the game and Meazza had still not shown up. The directors became nervous and sent a masseuse and another trainer in a car to find him. They found him in bed, sleeping profoundly and snoring. Without even washing his face, they dragged him up and rushed him to the stadium. While lying down in the back seat Meazza told them of love filled night and said he felt like a lion. The Lion Meazza entered the dressing room and without any squabbling, they quickly gave him his number 9 jersey. He scored two goals that game and was the best on the field. Inter won the game 2–1 and beat Juventus for the Serie A scudetto by two points. When Ambrosiana beat Bari in the 1937/38 championship, he scored five goals in a 9–2 victory. The next week he scored a hat-trick against Lucchese. 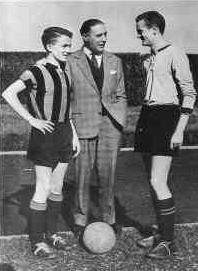 Along with fellow Inter players Ferraris II, Ferrari, and Locatelli, Meazza was involved in the Azzurri set-up that wins the 1938 World Cup in Paris. The same year, Inter won their fourth Scudetto, while the clubs first Coppa Italia success came in 1939. Hai ragione Andrea, Meazza ha fatto molti goal in tutte le squadre in cui ha giocato. Solo nell’Atalanta non ne ha fatti molti, ma era già molto avanti con la carriera! segnando ben 10 reti ! Grande meazza hai fatto la storia dell’inter! !